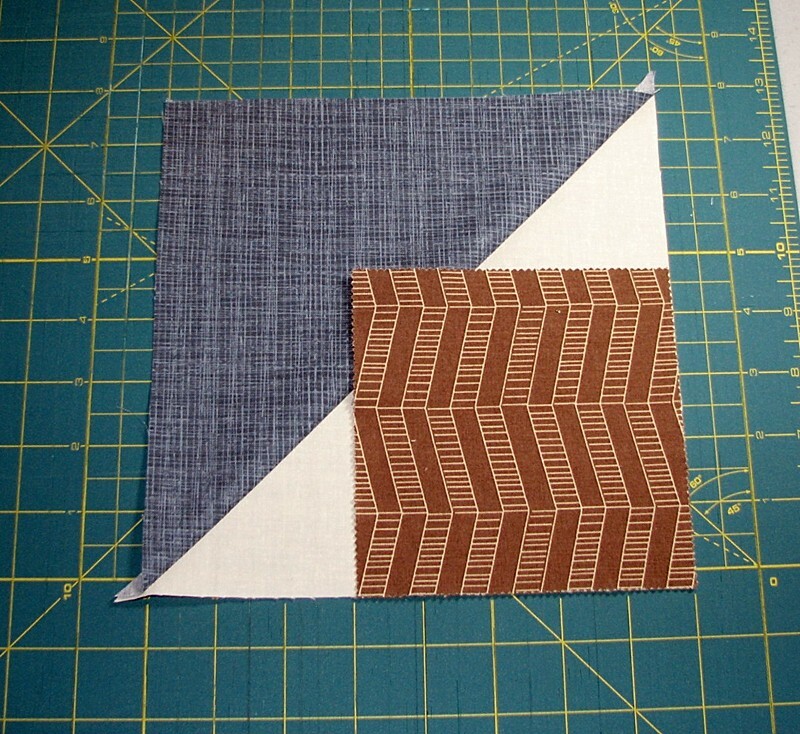 Step 1: Make a half square triangle block. 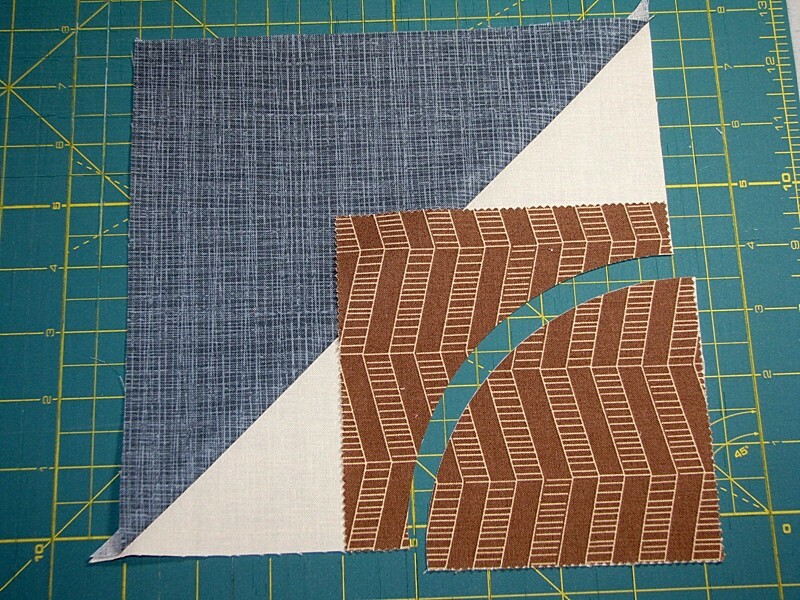 I cut two 8 1/2″ inch squares of my chosen light and dark fabric, put them right-sides together and drew a diagonal line on the back from corner to corner. 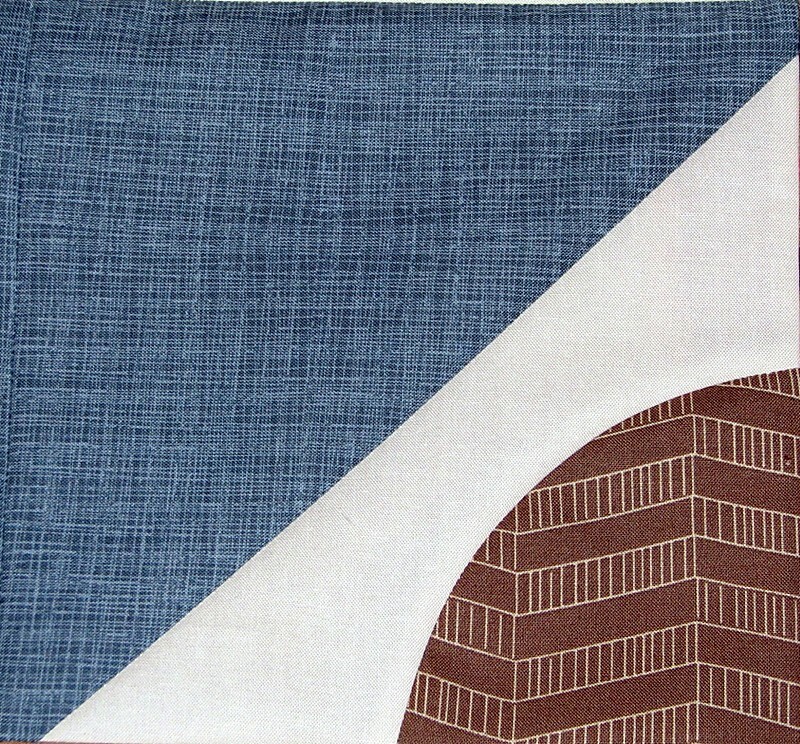 I then sewed the two squares together with a stitched line 1/4″ from the center drawn line on both sides of the line. After cutting through the center line I had two completed half-square triangles. Lay your HST block on your cutting board right side up with the light triangle on the bottom right. Choose a charm square and lay it on top of the HST, right side up lining the edges up with the right lower corner of your HST block. 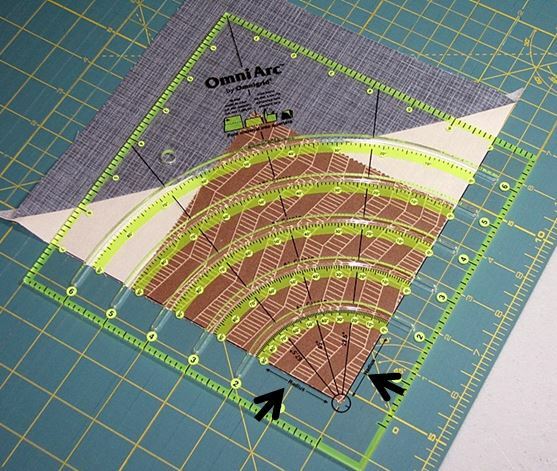 Lay your Omni Arc ruler on top of your block and align the right and bottom ruler lines as shown. There are lines clearly marked on the ruler for you to align the edges of your block before you cut arcs into your square. 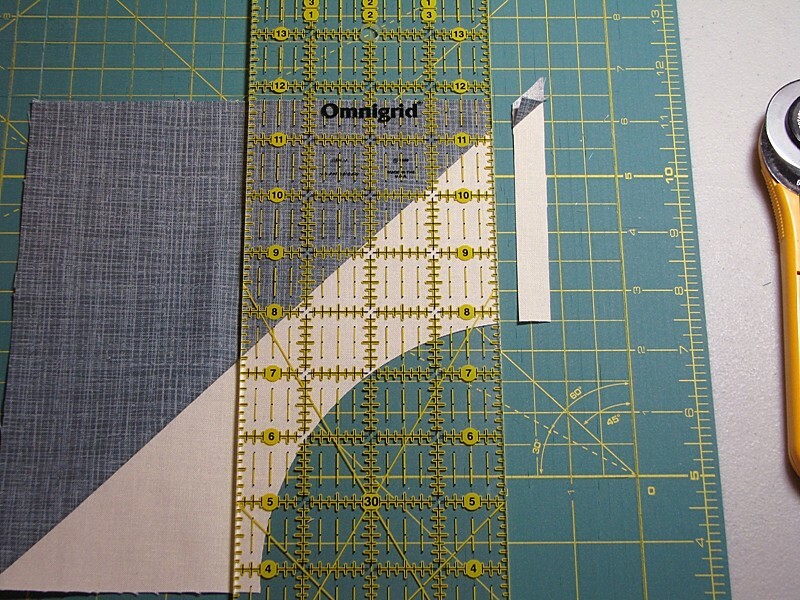 Choose a line for the size of the wedge shape you desire for your block. 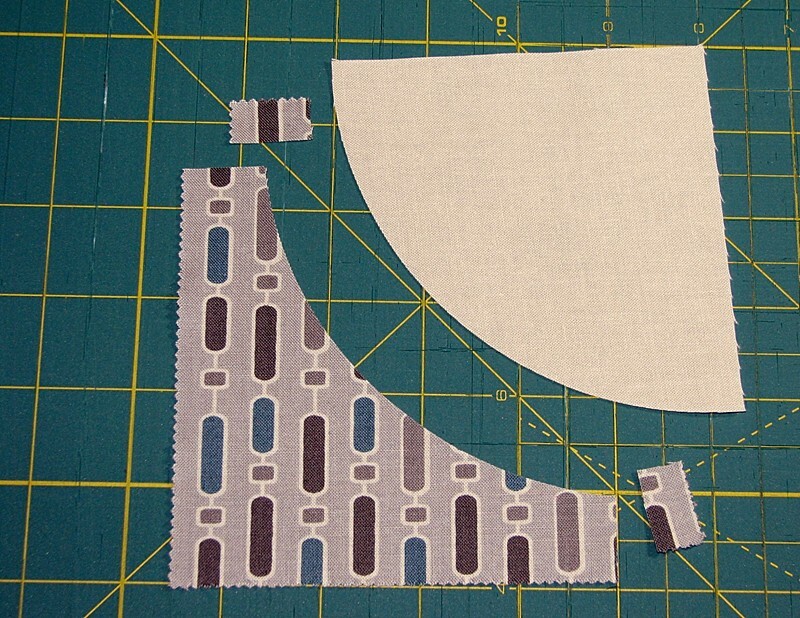 I chose arc line number 4 so that I would have some fabric left from the charm square to use in a different block. 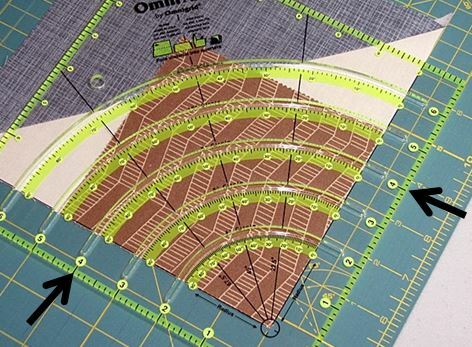 Place your rotary cutter blade into the cut-out section of the ruler and cut your curved line. I was able to successfully do this with my 45 mm blade without a problem. 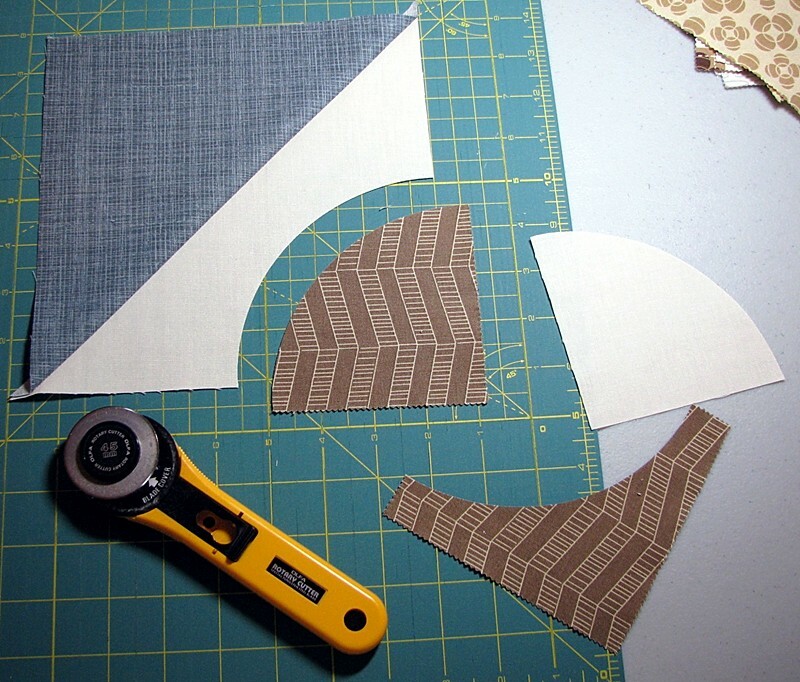 Set aside the light wedge and dark L-shaped piece to sew together later. You’ll get a nice stack of these as you make additional blocks. Your wedge will now be bigger than the curve in the square. 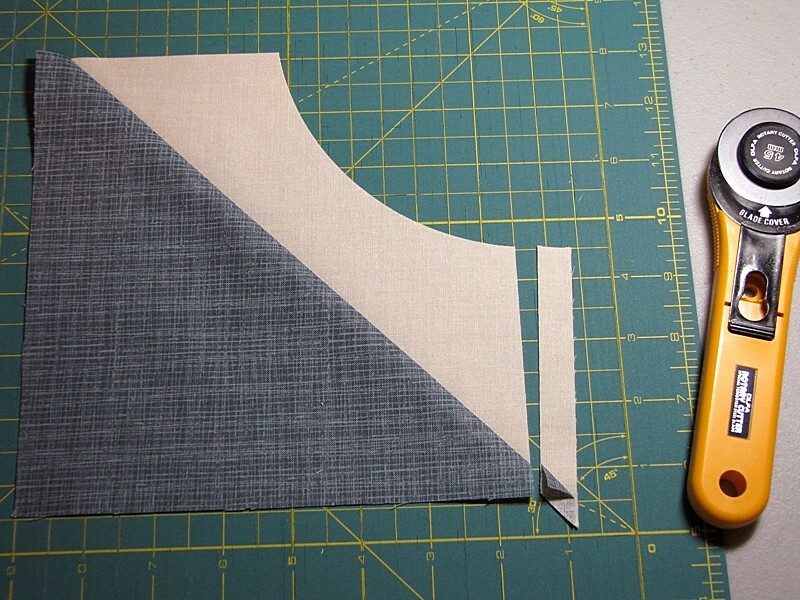 These cuts will account for the seam allowance when you sew your wedge into the curve. Sew the wedge into the curve using a technique with which you are most comfortable. I started by pinning just once in the center, but after doing that for a while I switched to the No-Pin technique that I linked in my front-page posting. Again, I found that if you stretched your wedge a little while sewing and it didn’t quite line up on the end, just square it up. 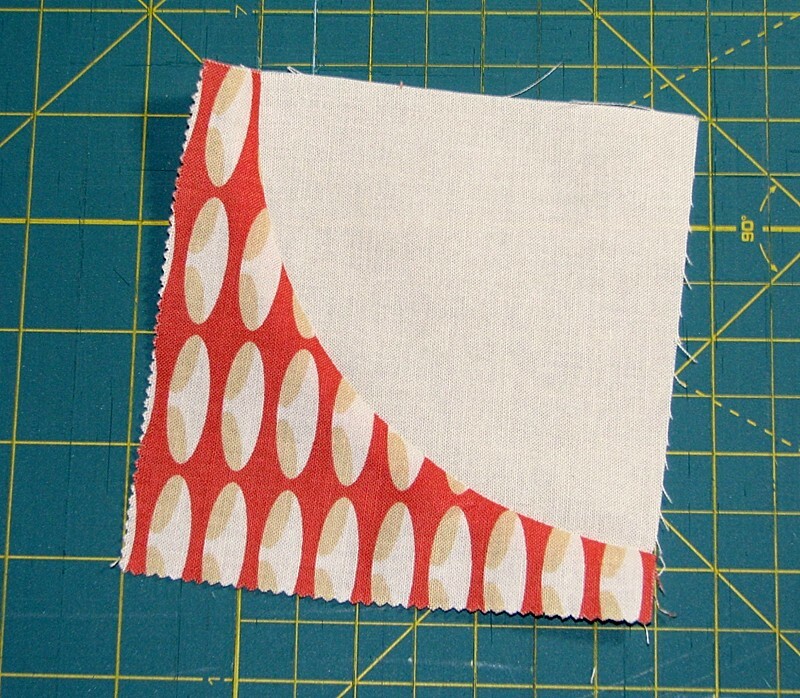 But if you are squaring up, and are reducing the sizes of some of your blocks, you’ll need to do that to all of your blocks so that they sew together correctly. 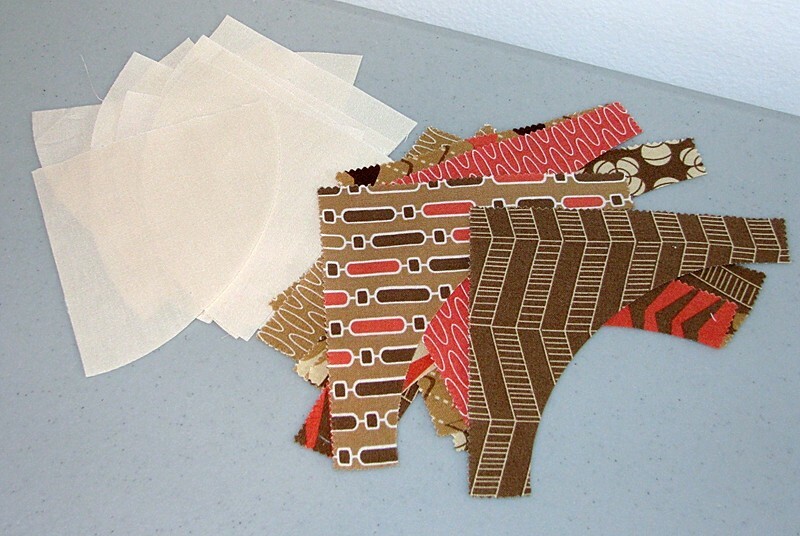 Just like you did with the larger block, cut 1/2″ pieces off of the ends of your print L-shaped piece. 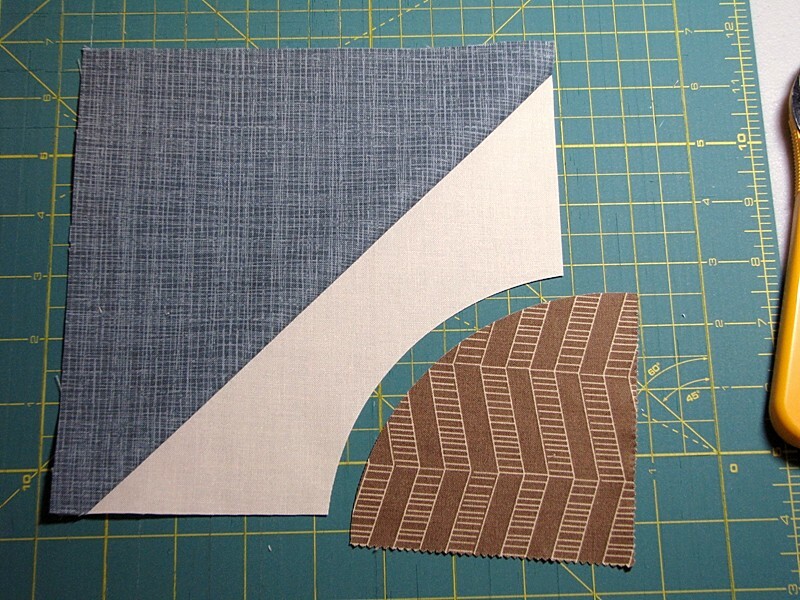 Then sew your light-colored wedge into the curve using your chosen method. 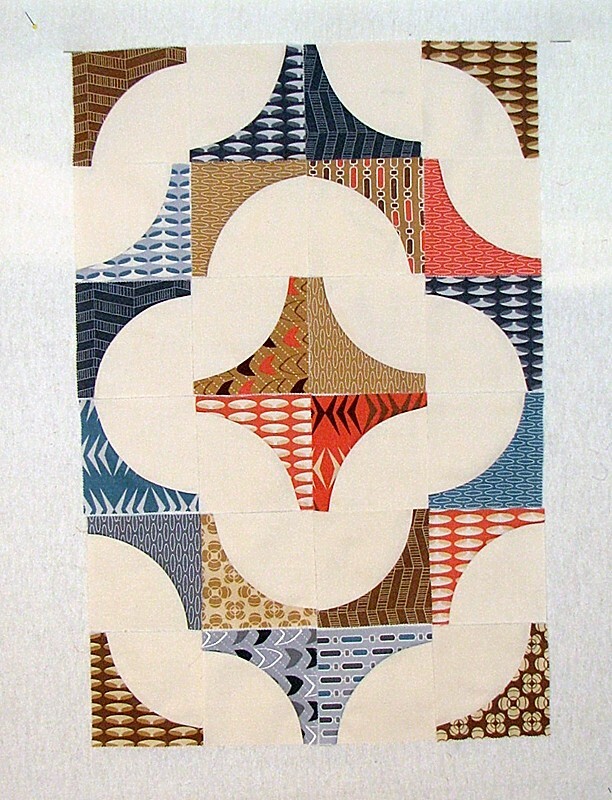 These finish at about 4″ square. 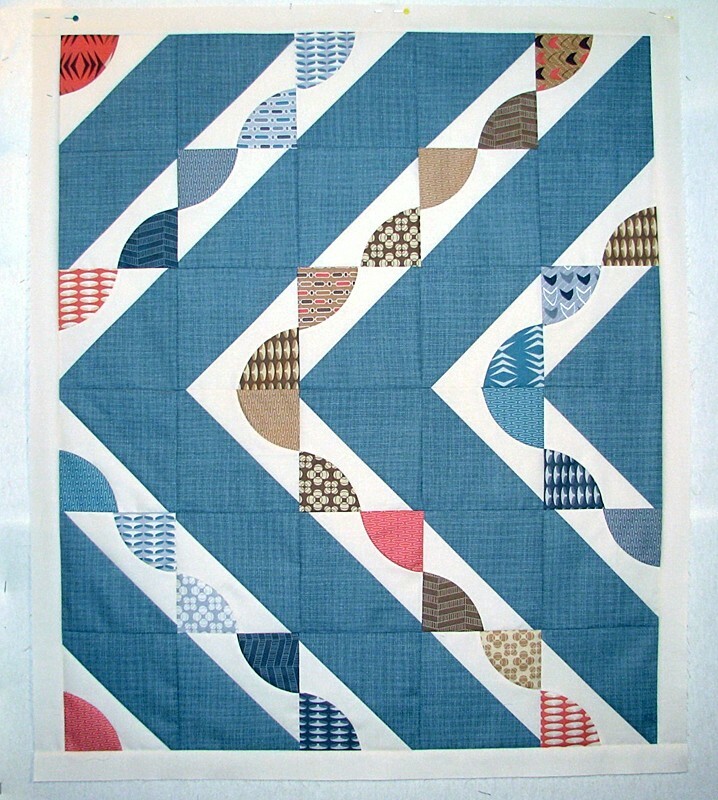 You’ll have a stack of small Drunkard’s Path blocks that you can incorporate somehow into a quilt of your own design, or use in the backing for this quilt if desired! I hope you have fun trying out this block for yourself! I was really excited and pleased with how my experiment turned out. I love what you’ve done with this block and how well you’ve explained it. I want to give this a try.